The Mountains of Sorrow are aptly named, for they have been the site of the unending clash between Goblin and Dwarf. The Cave Goblins seek merely to throw themselves upon any foe with the will to fight. The Guild Dwarves sit in their mountain halls, jealously guarding their ancient riches. But with the discovery of the Summoning Stones comes a new kind of combat, and now these two great races will help set off the War for Itharia. This Summoner Wars Starter Set provides 2 complete Faction decks, as well as all the materials needed to play games of Summoner Wars. 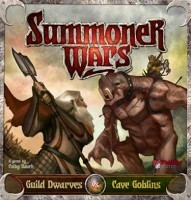 Add a Review for "Summoner Wars: Guild Dwarves vs Cave Goblins"